Hello and welcome to the second preview for Legendary® Venom. Discovered by Venomised Dr. Strange, the Poisons are a string of Alien lifeforms that, much like Klyntar (Venom), bind themselves to a host. However, unlike that of Venom, the Poisons act more akin to parasites feeding off and controlling an unwilling host, rather than forming a mutual partnership. 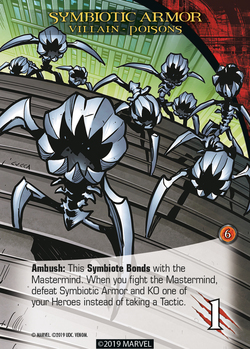 Each Poison card has the ability Symbiote Bonds, which enables them to combine attack power with another villain. Displayed above, if the card “Poison Spider-Man” is fought and “Dr. Carlton Drake” is currently in the city on the bank location, then the two would be placed together and hold a combined attack power of 7. 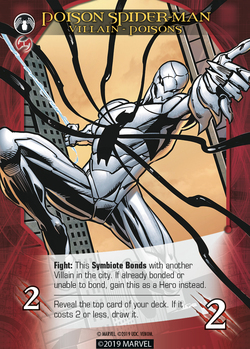 In cases where the villain is already bonded or no villains were in the city, then the card would be recruited as a hero instead. 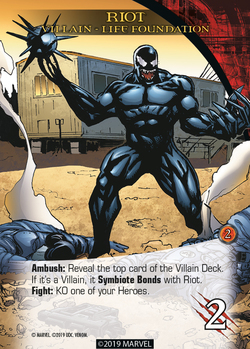 In preparation to create and exclusive upper-crust paradise, Dr. Carlton Drake and the Life Foundation forcibly spawned five new symbiotes from the original Venom in hopes to produce a new league of super-police to guard this new utopia, bringing to life Riot, Lasher, Phage, Agony, and Scream. It’s easy to say that the Life Foundation holds little parental affection for Venom. Like the Poisons, these five symbiotes share the keyword: Symbiote Bonds, which allows them to bond with villains when they enter the city. However, Symbiotes Bonds is slightly different than Poisons and taking one down takes a couple more steps. Then put either one of the villain cards from the combined villain into your victory pile and do that card’s fight effect. This brings to conclusion the villain portion of the Legendary Venom previews. Make sure to look out for our final dive into the Venomverse. Be sure to pre-order the game or pick it up once it releases at your local FLGS. Legendary Venom is landing March 5th 2019! Poison Spider-Man’s “Symbiote Bonds” is a Fight effect but the blog post says it bonds when drawn, which would make it an Ambush effect. Which should it be, or does it do both? Thanks for highlighting we’ve updated it.